The culture of business and environment has been dramatically changed in the past few years. Presence of digitization and visual data sharing technology changes the business and shaping it in a new a way to achieve desired goals. Today the world is heading towards globalization, multinational enterprises are shifting towards video conferences and meetings in order to obtain effective results and decisions from off-shore branches. These factors flourish the culture of the business which helps to enhance the productivity of the business. The video conferencing solutions help the organizations to achieve the desired goals by discussing the strategies and providing trainings over video conferences to enhance the business output. And, the enterprise video conferencing market has grown up significantly due to introduction of web-based technology with fewer complications by the IT sector. These factors will help the enterprise to expand and operate their business efficiently from the remote locations. 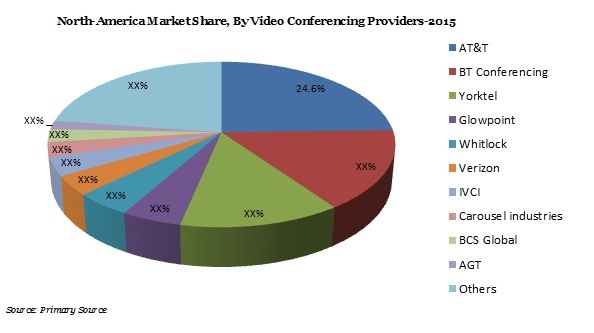 The global enterprise video conferencing market is expected to reach USD 7.94 Billion by 2023 from USD 3.85 Billion in 2015 and it is expected to expand at a CAGR of 7.44%% over the forecast period i.e. 2015-2023. Rising adoption of video conferencing facilities in healthcare and education sectors across the globe has strengthened the demand for enterprise video conferencing. The North-America market accounted for the largest revenue share of 38.14% in 2014 in overall enterprise video conferencing market across the globe and it is expected to maintain its dominance in the near future. Rising adoption of video conferencing facilities in corporate enterprises are expected to drive the market of enterprise video conferencing across North-America in near future. The improvement in productivity among the workforce of the enterprises through video conferences and meeting is expected to trigger the market for enterprise video conferencing during the forecast period i.e. 2015-2023. There is a continuous expansion of internet-based services to enhance the video conferencing quality and introduction of fast internet networks such as 4G has intensified the demand for enterprise video conferencing over the past few years. Moreover, rising popularity of managed video conferencing and cloud based conferencing as well as enhanced video-interfaces are some of the key factors which will further propel the market growth of enterprise video conferencing globally in future. However, increasing facilities of communication and installation of internet based devices in educational institutes are expected to grow the demand for enterprise video conferencing across the globe. Another major factor driving the growth of enterprise video conferencing market is increase in penetration of applications of video conferencing in healthcare sectors. Flexibility of working through remote locations, reduction in capital expenditures, owing of powerful tools for communication and growing need for effective communication purposes in corporate enterprise are believed to be the major drivers for the enterprise video conferencing market over the forecast period 2015-2023. Introduction of cloud-based video conferences and high-end technology video interfaces are likely to fuel the growth for enterprise video conferencing market in the near future. The need for better and cost-effective technology for communication purposes has increased in past few years by the multinational organizations which are looking to expand their business across the globe. Apart from this, the security in the sector of communication plays a crucial role in order to maintain confidentiality of the video conferences and communication. The lack of security in communication and rising unethical activities such as hacking are expected to hinder the growth for enterprise video conferencing market globally. High cost of video conferencing equipment and lack of communication technology in rural regions is likely to have connectivity issues and deficient of latest technology equipment in the region. These factors are expected to retrain the growth of enterprise video conferencing market across the globe.